City-state holds first-ever large-scale exercise there amid rising terror threat. In the early hours of October 17, Singapore staged the first-ever large scale counterterrorism drills at Changi International Airport. The interagency exercise, which was observed by top officials, is yet another sign of the city-state’s determination to boost its readiness amid the rising terror threat in the wider region. As I have noted before, Singapore has long been warning about the Islamic State threat in Southeast Asia and has been taking a series of steps to both contribute to confronting the challenge abroad as well as strengthening its response at home (See: “Singapore Warns of Islamic State Base in Southeast Asia”). Domestically, policymakers have been undertaking measures including boosting surveillance, investing more in rehabilitation programs, boosting public awareness, adjusting the way it conducts homeland defense and security operations, and using various means including drills to assess their responses (See: “Singapore Reveals New Military Facility Amid Rising Islamic State Threat”). One of these exercises is Exercise Northstar. First introduced in 1997, it is intended to test the readiness and coordination between national agencies in responding to major emergencies and countering terrorist threats. A range of scenarios have been fashioned under this exercise over the years. From 1 a.m. to 3 a.m. Tuesday morning Singapore time, authorities in the city-state held the tenth edition of Exercise Northstar in the form of the first-ever large scale counterterrorism exercise at Changi Airport. The drill involved more than 650 personnel from the Singapore Police Force (SPF), along with the Changi Airport Group, Civil Aviation Authority of Singapore, Singapore Armed Forces, Singapore Civil Defense Force, Ministry of Health and other agencies. The scenario for the exercise was responding to six gunmen and a suicide bomber in Terminal 3 of Changi Airport in what was simulated as a busy Saturday afternoon. According to official accounts of the exercise, the gunmen were eventually neutralized, an improvised explosive device (IED) was disarmed, and personnel rushed casualties to a first aid point outside the terminal for emergency help. Singapore Prime Minister Lee Hsien Loong, who personally observed the exercise along with other top officials, emphasized the importance of preparing for large scale emergencies through realistic drills because of Singapore’s vulnerability to terror attacks. He also underlined the realistic nature of the exercise given the fact that busy airports like Changi were high profile targets that had been targeted by terrorist groups in the past. 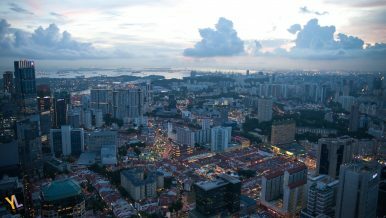 A second phase of Exercise Northstar, Singapore officials have said, is expected to be held on October 28 at the Home Team Tactical Center, and will involve a different scenario. The counterterrorism exercise comes amid growing fears about potential terrorist attacks. What Singapore’s Radical Preacher Ban Says About ASEAN’s Terror WarA First: Indonesia-Singapore Naval Exercise Features Maritime Counterterrorism ComponentSingapore Reveals New Military Facility Amid Rising Islamic State ThreatSingapore Launches Biggest Military Mobilization Drills in DecadesWhat's Next for the New ASEAN ‘Our Eyes’ Intelligence Initiative?